Andrew Henry Says: We pass this sign every week on our way out to the auction. That 25 cents gets me every time. Why isn't the price just $586.00 or $587.00? What difference can the extra 25cents make? When our daughter was home last month, she was struck by something else, the word "complete". 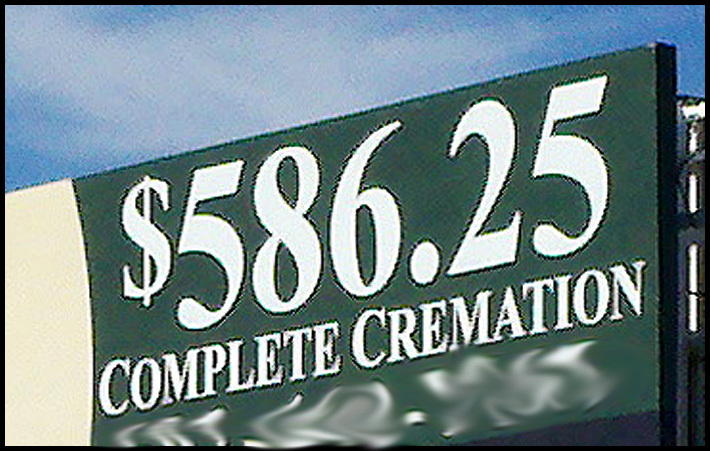 That got us wondering how much an "incomplete" cremation would cost? Jeanette says: He's been wanting to show ya'll this for months. I smeared up the phone number for their privacy. It is kind of weird sign. So sorry I forgot to announce the necklace giveaway winners! This is the hard part for me because I want you all to win. I'll just have to do another giveaway soon. mailing address - thanks to everyone for entering. Oddly - this made me chuckle. Kind of tells you where I am mentally this morning - LOL. I too would like to know the options and differences to which they are eluding! But I guess, as far as information goes- its one of those things you see and think "Hey, good to know". Happy Monday! Thanks AH for another great post! OMG - that sign is hysterical!!! So bizarre - certainly makes you wonder. And congrats to the winners!! I thought it was just as funny as my dad. Happy Monday everyone! OH MAN! That is scary funny! I have to wonder if without the extra 25 cents there would still be remaining fingernails or something. So, I'd NEVER let them carve pumpkins on my carpet - we moved the kitchen table and they spread out on the linoleum ... (video can be deceiving). Have a wonderful week Jeanette! And please pass on to your husband how much I enjoy his posts. Advertising...designed to get one's attention and this sign certainly does just that! Thank you so so much Jeanette. I cannot believe it!! 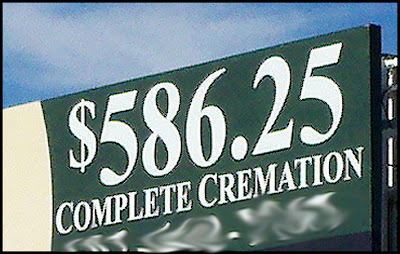 I think you should call the cremation company and do a follow up Ha! wahahahahah... I am in a gallows humor this morning. Believe it or not, I'm bummed I didn't win this giveaway (even though I make jewelry I can't make these and I really love them). Karena deserves to win, she hosts so many giveaways. Ok, I love this! Hilarious, on both counts!